The Swiss Mitsubishi importer has demonstrated that a plug-in hybrid Mitsubishi Outlander PHEV can travel 830 km (518 miles) on a single tank of petrol. Mitsubishi Motors claims the plug-in hybrid Outlander PHEV has a range of 824 kilometers (512 Miles) in the combined hybrid mode. The Swiss Mitsubishi importer wanted to know whether this is feasible in practice so hired Felix Egolf - a pioneer in the field of ultra-efficient driving over long distances. Egolf departed on 12 May in a hybrid Outlander from the headquarters of the Swiss importer Härkingen and drove through Basel and the Vosges to Metz. From there he went through Luxembourg, Belgium and the Netherlands. End of the journey was the Dutch Mitsubishi importer in Amstelveen, where Egolf arrived on May 14. The route began in hilly area and 38 percent of the journey performed over highways. Upon arrival in Amstelveen odometer gave 729 kilometers and the remaining range was further than 90 kilometers. 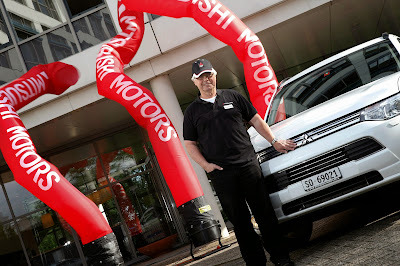 Egolf then drove the Outlander PHEV for a photoshoot to Amsterdam and Utrecht. The onboard computer gave a mileage of more than 830km to when the Outlander PHEV was refueled. For the first time since leaving again There was 45.14 liters of petrol in the tank, which means that consumption 5.44 liters per 100 km. The electricity was approximately 1 kWh/100 km. Mitsubishi Motors gives the official standard as a range of 824 kilometers. So that, in practice, is actually feasible. Of course, the driver must anticipate well in traffic and clever use of plug-in hybrid technique. That is, charge the battery while driving (CHARGE) or save energy (SAVE) and continuous regeneration system utilization, which produce electricity, which is stored in the battery during braking. EV News will be picking up a Mitsubishi Outlander PHEV for a test drive next week so perhaps we can also test the 800+ km range.